This is the name of my tiny quilt submission for the Alzheimer's Art Quilt Initiative (AAQI) Priority: Alzheimer's Quilts Program. Founded by quilt designer, Ami Simms, the AAQI is a national grass-roots charity whose mission is to raise awareness and fund Alzheimer's research. 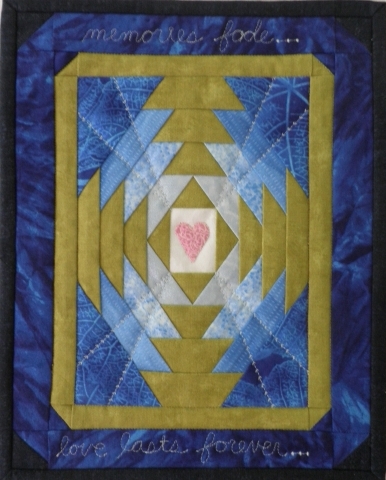 In 2011, my guild, the Courthouse Quilters of Hunterdon County, challenged its members to create these tiny quilts (no larger than 9" x 12" to be able to fit in a Priority Mail envelope) to submit to the organization. 22 quilts were submitted, 12 of which have been either sold or auctioned off on-line raising $825. Actual size pictures of the quilts previously submitted as well as 12 new quilts (soon to be sumitted) will be on display at "Quilts in the Mill", the guild's biennial quilt show at the Prallsville Mills in Stockton, NJ, October 5-7, 2012.